Recovery Time Objective refers to the timeframe in which your business needs to have been recovered after a disaster has struck. Within this, you would estimate the amount of 'real time' that can pass before disruptions begin to seriously affect normal business operations. By having this timeframe, it gives you scope to the potential damage of the disaster. For example, if you find that your RTO is 10 hours, meaning your business can survive without its systems for that amount of time. If that is the case, a high-level of preparation/budget is needed to achieve this objective. If it is one week, then you may be able to reduce your budget and invest in less advanced solutions. Recovery Point Objective refers to your companies "loss tolerance"; how much data can be lost before significant harm is noticeable? If this time is exceeded what is the maximum allowable threshold? The objective is expressed as a time measurement (from seconds to days) from the loss event to the most recent preceding backup. For example, if you back up your server once a night, your RPO could be 24 Hours. If you replicate your server in real time, your RPO could be seconds. 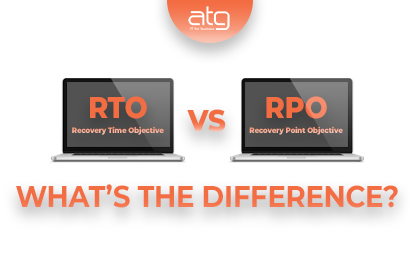 What are the main differences between RTO and RPO? RTO is concerned with key applications and systems that'll affect your business operations. RPO is concerned with the amount of data lost in the event of a disaster and how resilient your business can be. What are the similarities between RTO and RPO? Even the most profitable firms could not afford to deliver near-zero RTO or RPO for all applications. Investing in failover virtual environments is the only way to guarantee 100% uptime (RTO) and no data loss (RPO). Both RTO and RPO are valued in units of time. Both of these metrics should be considered when looking to develop an effective business continuity plan. If you are looking to improve or develop your RTO and RPO. Get in touch today! and let's see how our business continuity systems can help. Alternatively, if you'd like to make a head start on your Business Continuity Plan, download our FREE template by clicking the link below.